The INCT has been collaborating with the IAEA in various capacities for many years in projects dealing with the application of nuclear science and technology to the fields of energy, environment, health, and agriculture. Their consultative work also contributes to the capacity of Member States in applying radiation technology to the management of agricultural and industrial waste and the decontamination of biological agents. The Institute operates six electron accelerators, including four at plants for food irradiation, sterilization, polymer crosslinking and two laboratory gamma irradiators. As an example of applied radiation technology to air pollution control, INCT developed electron beam flue gas treatment technology applied at an industrial scale. 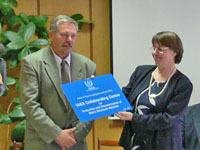 The CNA has been collaborating with the IAEA’s marine Laboratory in Monaco since 2007 in two different areas: the determination of ultra-low concentrations of long lived radionuclides by accelerator mass spectrometry in marine samples, and the characterization of radioactivity bearing particles present in different environmental compartments. As an IAEA collaborating centre, their work seeks to provide Member States with state-of-the-art accelerator-based science. The IAEA collaborates with the Food and Feed Safety Directorate in activities closely linked to the IAEA’s projects “Supporting Analytical Laboratory Performance” and “Reference materials for terrestrial environments.” Their objective is to enhance the reliability and comparability of measurement results obtained by nuclear and nuclear related analytical techniques in Member State laboratories through the provision of reference materials, the conduct of proficiency tests, interlaboratory comparisons and provision of training. Recently, they have been working to develop and disseminate results of proficiency tests on the determination of naturally occurring radionuclides in water and other environmental samples. 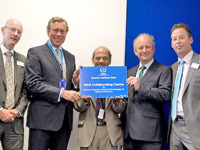 ELETTRA Laboratory was designated a collaborating center in recognition of their successful training and research activities in both developed and developing countries, and plays a leading role in the IAEA’s plans with regards to accelerator physics, synchrotron light and free-electron lasers.